The badge firmware provides a launcher, an installer, and a set of pre-installed eggs. Users can install more eggs by running the installer from the launcher menu. Developers can easily create their own MicroPython eggs, for which there is a MicroPython badge API reference. For beginners, we've produced a tutorial in which we take you through the creation of a Hello World egg. Publishing apps can be done on the hatchery at https://badge.team, or directly to the badge itself via USB if you are not ready to share your code with the world. We have a step-by-step guide to USB deployment for first-time developers which should allow you to get your app working on your badge. The firmware for this badge can be found at https://github.com/badgeteam/ESP32-Firmware . 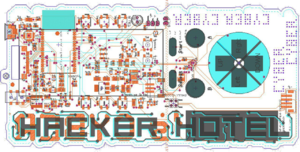 The HackerHotel2019 badge will run on our combined firmware. This makes LTS a lot easier because updates for one badge will usually be applied to the firmware of other badges too. 2+ years of MicroPython changes. IR support with many codecs. If the sound is weird, please first check the software tweaks. But you might want to do a hardware mod too. Connect via USB serial, press enter to get to the REPL shell. This page was last edited on 1 March 2019, at 16:21.